This is a Tagua crèche, made of the seed of Tagua palm trees. 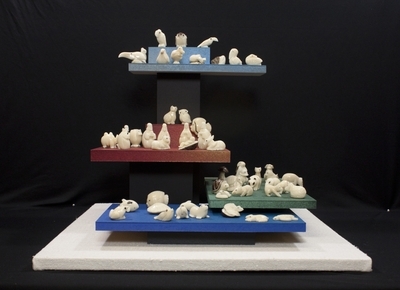 Tagua is also called “vegetal ivory.” This nativity features mostly animals living in Ecuador and the Galapagos. The tableau is brimming over with the life of creation gathering a great many of its representatives: animals of the deep blue, inhabitants of the earth, and creatures of the air. Jesus has come to gather the whole of creation. Lord of creation, he remains inconspicuous amid his creatures. Why? Incarnation is an act of humility on the part of God hailed with the humble praise of his little creatures. Nativity set depicting the nativity of Jesus carved from the seeds of Tagua palm trees by Johnny Coveno in Quito, Ecuador. The exact date of creation is unknown. Exhibition label originally written by Fr. Johann G. Roten, S.M. for exhibit held at Roesch Library, University of Dayton.